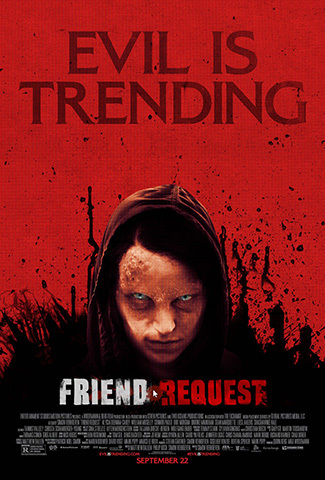 One would probably imagine that a creepy concoction such as writer-director Simon Verhoeven’s (“Men in the City”) bubble gum, horror/thriller Friend Request would take advantage of its exploitative ingredients to cultivate a half-way decent internet-based frightfest aimed at the under 30-something crowd. After all, where can one go wrong with a slasher featuring curvaceous collegiate cuties, heightened peer pressure beset by alienation, loneliness and despair, and the underlying social media that binds us all? Well, unfortunately, Verhoeven’s snore-gore fails to seize any opportunity to parlay those facets into any tension or terror in this vapid vehicle to the menacing mysteries of befriending the unknown at the other end of a keyboard. It shouldn’t be much of a surprise as there have been other so-called youth-oriented techno-horror flicks like “Feardotcom,” “Pulse,” and “Unfriended” that have attempted to tap into this formula with middling results. Try as they might, but Verhoeven and fellow screenwriters Matthew Ballen and Philip Koch never seem to get underneath the skin of the precarious presence of unstable misfits and the deceitful tool that can be (and many times is) the internet. Instead, Friend Request wallows in flat and faceless jump-cuts, leans on its generic jolts of hapless young pretty people too uninteresting to hack to death and the occasional dreary imagery produced to increase the grime factor. Naturally young adults attending college is an important step to personal and professional growth as the real world awaits their entry into the work force. However, some students have it better than others and are blessed with a promising future. For psychology major Laura (Alycia Debnam-Carey, “Fear the Walking Dead” TV series) this is certainly the case as this bookworm beauty seems to have it all — good looks, a cozy apartment and a hunky boyfriend named Tyler (William Moseley, “The Chronicles of Narnia: The Voyage of the Dawn Treader”) hanging on her arm. Importantly, Laura has bragging rights to show how popular she really is — she has an incredible following of over 800 Facebook friends. Not too shabby, right? Soon Laura will get a very rude awakening when she decides to accept the friend request of Marina (Liesl Ahlers), a bizarre and troubled Goth girl loner with a doomsday demeanor. Truth is, the desperate Marina is actually begging for Laura’s genuine undivided attention and wants to cement a solid, real friendship with her. Unfortunately, Laura is not as committed to connecting with Marina on this personal level and soon thereafter Laura breaks Marina’s already damaged psyche further by unfriending her. This leaves the inconsolable stalker no choice but to take her own life in humiliation. In the aftermath of Marina’s demise some gory goings-on recklessly occur and the unsuspecting Laura is the recipient of some unspeakable, out-of-control spirit released by the late Marina that decides to haunt and harass her via her trusty computer. As the indignant aura of Marina invades Laura’s infected computer system it chooses to wreak havoc against all of Laura’s circle of Facebook friends through sick-minded and questionable means. Basically, Laura and her host of admirers are paying a heavy price for her “betraying” the tormented Marina. Tis the price of popularity, I suppose. The far-fetched ideas in Friend Request could be overlooked if it was not so choppy and joyless in its predictable messiness. The film not only fails to capitalize on expanding its pseudo-biting commentary involving the modern-day reliance of social media and inadequate socialization among the disenfranchised hiding behind walls of anonymity, but it unwisely delves into mumbo-jumbo territory that touches slightly upon the occult with a gimmicky backstory. Inconsequential fodder involving abusive orphanages, self-deprecating detectives, wacky supernatural happenings, an affectionate uncertainty for Laura’s attraction concerning Tyler versus Kobe (Connor Paolo, “Camp Hell”) and a nonsensical Facebook doom and gloom debate — it all seems so arbitrary and strained. Emotionally empty and highlighted with sophomoric dialogue and lame twitches, denying this Friend Request is the next best thing to embracing an enemy on your Twitter account. I’m not surprised this is a flop as anything to do with friending or unfriending on facebook isn’t exactly genius material. The fact that people think they are special because they have hundreds of facebook friends is as pathetic as this movie appears to be. I love the review as it was clever and well written. Maybe the facebook friends will unfriend this as soon as possible making room in the theaters for some of the good films we so rarely get to see these days. Millennials are more pathetic than I thought. How weak one must be to kill oneself because of being ‘unfriended’ by someone online who was never a real friend. I guess there was no ‘safe space’ to find safety in.